The top offensive weapon playing with fire, helping lead charge for surging Blues in climb up Western Conference standings since start of January. ST. LOUIS -- Alex Pietrangelo has had a front-row seat for a plethora of highlight-reel goals, whether on the ice or on the bench. On a number of those, he's been able to marvel at ones scored by teammate Vladimir Tarasenko. With a front row seat on the bench Sunday in Nashville in overtime, Pietrangelo saw vintage Tarasenko, the one that's dazzled on many nights producing key goals for the Blues throughout his now seven-year NHL career. If this is the Tarasenko that's offered those broad shoulders to his teammates for the past six weeks and telling them to hop aboard for the remaining 28 as the Blues (27-22-5) continue their surge up the Western Conference standings, that climb will continue to see them soar. Sunday in Nashville, an entertaining 5-4 OT win for the Blues, which was their sixth straight victory, Tarasenko completed his fourth regular-season hat trick (he also has one on the playoffs) in star fashion. After teammate Ryan O'Reilly was poke-checked by Nashville's Viktor Arvidsson just inside the red line, Tarasenko pounced. He revved up with speed from his own zone, collected the puck and moved down the side right. Tarasenko's speed was apparently deceptive, as he was able to move past a speedy Arvidsson with no problem, and then as he's often done it -- you know it's coming but still have a hard time stopping it at times -- Tarasenko pierces with a quick cut to the middle of the ice looking for that spot in the slot. This time, he got all-star defenseman and Nashville captain Roman Josi to bite on a rush to the backhand ever so slightly. Once the puck was in stride, Nashville's Juuse Saros was staring down the left-handed curve of the blade that's puzzled many goalies before him. It was inevitable. The quick release, a wrister above the blocker, stick side. Goal No. 200 for his NHL regular-season career. Yes, you know it's coming. But how do you stop it? Pietrangelo has defended many star-studded players and defended them well. As Tarasenko's teammate, he still has trouble thinking of ways to stop him once Tarasenko's motor is in high gear. "I don't know how you play him," Pietrangelo said. "In that overtime, I don't know what you do. He had Josi beat pretty clean and that's a world-class defenseman. When you're such a threat to shoot like he is, you have to honor both things and when he gets moving like that, he's tough to stop. "... Pretty impressive. I think we all had a feeling there in overtime when he gets that move outside-in, you're not stopping him. We're going to need him to keep doing that. He's on a roll." The goal was Tarasenko's fourth in a weekend home-and-home sweep of the Predators (the Blues won 3-2 Saturday with Tarasenko scoring one) and 11th in 15 games to double his output of the previous 37 games. Call it determination. Call it clutch. On Sunday, the Blues, who are 12-4-1 when Tarasenko scores, called it two points. "When you do this (cut move) a lot, you know teams start taking it away," Tarasenko said. "Not many times you can do it right now. League gets faster. Guys defend really well, but sometimes it works and it works in overtime." Case closed. All it needed was 16 ticks off the clock. "He made something out of nothing and won us the game," O'Reilly said of Tarasenko. "He was a huge reason why we won tonight." The 27-year-old has always had the talent. Former Blues coach Ken Hitchcock once said Tarasenko is one of those few players in the league that can score from anywhere on the ice. That's a given, but like the rest of his teammates, Tarasenko's game was inconsistent. He wouldn't admit it when asked earlier in the season if the off-season shoulder surgery last year took time to not only get over physically but mentally as well. He wasn't precise with that lethal shot of his. There seemed to be tentativeness in his game, not being that factor, that player who cam turn a game on a dime, prompting his name to be floated about in trade rumors along with other prominent names. The Blues were closer to the NHL's basement as 2018 closed than they were in playoff contention. People were down on Tarasenko, from fans to the media. Bur since the calendar turned to 2019, not only is Tarasenko playing with pace and skill, he's edgy, he's playing mean, playing with a feisty, angry attitude, sacrificing his body, backchecking, forechecking, getting pucks in deep, working with his linemates and blocking shots. Basically making a difference on both sides of the ice. Remember, it was Tarasenko whose back check against Tampa Bay last Thursday helped the Blues win 1-0 on Brayden Schenn's goal. In short, Tarasenko's being the leader that the 'A' on his sweater represents. Not just a guy the ice looking to score but a difference-maker in all facets. "It's an important time of the year for us," Tarasenko said. "It's time to step up like all our leaders and everybody else in this locker room. We want to get in the playoffs, so that's what we're playing for. "We have a lot of memories with Nashville, especially from past. They're our division opponents. I think you ask me [Saturday], every game is like a playoff game. Just try to go for 100 percent and play for every win." Tarasenko looks confident, he looks healthy and he's playing with fire in his eyes. Just don't ask him about his game. He'll let the results speak for themselves. "I don't know. I don't like talking about my own game, you know," Tarasenko said. "Better guys who like hockey can tell us (how he's playing)." With 41 points (22 goals, 19 assists) in 53 games, the numbers aren't jumping off the charts like past seasons. That's because early in the season, it wasn't happening not only for Tarasenko but many of his teammates. But he has a career-tying high eight-game point streak (seven goals, five assists) going into today's home game against the New Jersey Devils and there's something there again with two linemates that's making it click. Tarasenko, Ryan O'Reilly and Brayden Schenn have combined for 23 points (nine goals, 14 assists) since interim coach Craig Berube assembled it Jan. 23 at Anaheim and it's skyrocketed from there with nothing but positive results. It's a dominant line and very reminiscent of the success Tarasenko had last season with Schenn and Jaden Schwartz to begin the season. "The whole line is really effective," Berube said. "They work hard, it's a good line, got good chemistry, the work ethic from all three is paying off for sure. "The three goals are huge, [Tarasenko's] feeling it right now for sure. I thought he had a strong game scoring three goals. He had eight shots on net (Sunday), so he's a strong player tonight." When things are going well, the puck seems to find the back of the net, and for Tarasenko, who lifted his shooting percentage up to 11.5 percent from 10.6 after Saturday, scored a goal-scorer's goal in the second period, a snipe high glove from the left face-off dot before getting a wonky bouncer from the right circle in the third period that caromed off Nashville d-man Ryan Ellis and in. Earlier in the season, those likely don't go in. But when they are going in, they tend to do so in different fashion. 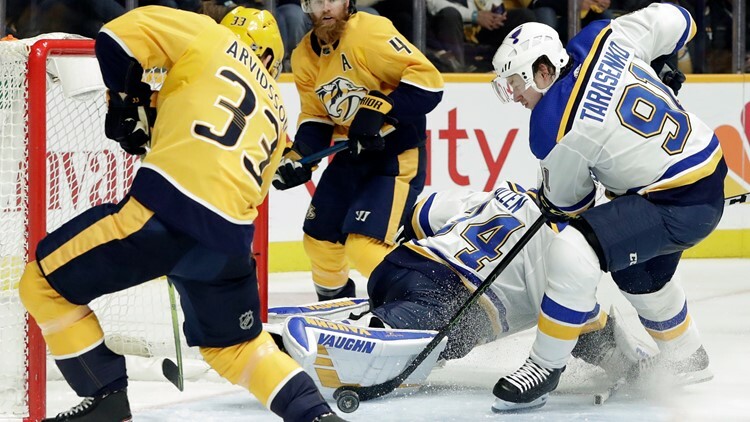 "He's got confidence in that stick, whatever stick he's got, he's made the most of it," Blues goalie Jake Allen said of Tarasenko, teammates since 2012. "He's scoring at key times, which is even more impressive. That fourth goal (Sunday), I know it went off someone, but it's a crucial goal. He's really doing is job and he's got confidence in his stick. When he does that, he's tough to stop." Nobody could have expected the Blues to bag six of a possible six points playing three games in three and a half days against the NHL's top team (Tampa Bay) and Nashville, which came in fifth in the league, in back-to-back games. But with Tarasenko leading the charge, the Blues did, and they can only hope that Russian engine is revved with high octane up for a while longer. "I'm not going to lie, those are really hard games," Tarasenko said after the game Sunday. "I said it yesterday, I'll say it today, I'm proud of how hard we work. We handled top situations in games. Goalies play great, Jake and 'Binny'. It doesn't feel like a lot of emotions right now because I'm kind of tired, two games in one day almost. We'll just rest and probably feel nicer. "... Now we try to play for our season. We just prepare for every game like it's the last game of the year and try to win."